has popped my first photos in a national magazine cherry. 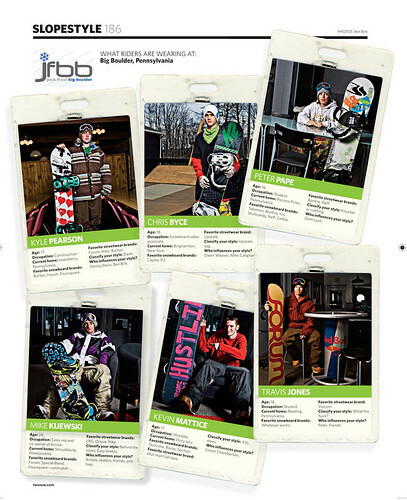 I was contacted last winter to shoot the slopestyle page for transworld at Big Boulder. Not much I can write about it, so I will just show you the photos. They have a few more photos of mine that I hope will be used so we will see how the year turns out. The best thing is seeing my name in the contributing photographers list along with Tim Zimmerman, Andy Wright, Cole Barash, and the rest of my favorite pro shooters. So on this blog I’m also going to highlight some of the products I purchase. I recently dropped my 500GB external hard drive and thought it was broken. So I went to Newegg and with help from Jason Wager of plzthxbai I found a new 500GB drive and dual-bay external enclosure. To my pleasant surprise when I added in my old drive that had fallen to the floor it still worked, giving me access to a total of 1TB of backup, and saving me the money from buying a new drive. I set up one of the two drives as my Time Machine, to back up my computer and photos off one of the WD Passport drives I own, and the second of the two drives as a manual back up of photos again off the WD Passport and storage of music, movies, ext. When both of the drives are in casing it weighs quite a bit (case empty is 4lbs). Enough that you could break some bones in your foot if you were to drop it. When it is plugged in, it’s almost completely silent and the fan is also undetectable when turned on. One negative is that it only comes in USB, and they make an eSATA/USB but it is listed as a RAID server, and quite a bit more expensive. A firewire 400 or 800 option on the model I bought would have been a nice choice. All in all I am very happy with the purchase, and would recommend it to anyone who wants to do some simple backups or create a small RAID. Here is a photo of the drive and my computer. The external drive and my Mac. I have been using Adobe Lightroom for just over a year now, and it has almost completely taken over my whole photography workflow. I won’t go into detail about how much I love Lightroom, I’ll save it for another posting, but I do want to talk about the new book I bought by Martin Evening, The Adobe Photoshop Lightroom 2 Book: The Complete Guide for Photographers(here). This book is over 600 pages, and its not 450 pages of repeat from Lightoom 1 (so says the back cover). So far I have found all the information in the book useful. I would highly recommend the book to anyone who is starting out with Lighroom, or an experienced pro that wants to keep up with the new features. I am excited to really dig into this book, and will keep you up to date on my progress. Spring is totally over and I’m already thinking summer is to. I’m looking towards next winter, and what I need. I am getting a new camera, and seriously considering getting a sled. The one I have been looking at is a Ski-Doo Summit 600cc between 05 and 06. If any one has one, has any recommendations on other sleds or any information I need to know about them please contact me. The reason I need the sled is I’m finally making the move out west, and have chosen Truckee in Tahoe as my place of residence. Super stoked to get out west and be able to shoot at bigger locations and with more people. If you want to shoot this winter drop me a line. I am going to try and keep this thing up to date much more, now that winter is coming. I will also update this blog as my images get ran in magazines this year. In an effort to make myself more of an online presence I have created this blog. I will use it to mostly keep everyone up to date on my photography, along with other random things I decide to add in.